Depending on what use you need your garage doors to perform, there are two basic types that will work for you in an economical fashion. 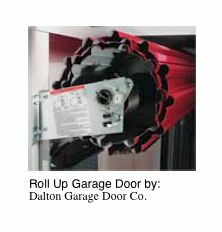 The first type rolls up into a tube format and when open is not overhead above the floor leaving the ceiling area clear. The second type when open is overhead above the floor space and blocks the ceiling area above it. They both have advantages depending on how you use them. First, the roll up doors can be somewhat hard to operate. They are usually the type of door you see on Storage Unit Facilities all across America. They are available in various widths and heights up to around 10' x 10'. The image at the right shows a detailed view of this type of door when open. Generally, these type of doors do not lend themselves to having a power operator attached to them, at least not for residential purposes. Another disadvantage of the roll-up doors is that they cannot be insulated due to the flexible nature of their design. This may, or may not be a factor in your door type decisions, as most garages are not insulated. Some of their advantages are: if you only use them to get a riding mower and other garden equipment in and out on a weekly basis, they are very serviceable, especially in widths up to 5', and fairly easy to operate. Another advantage is they leave ceiling storage space directly above the door opening so that you can maximize the area for storage. The one shown above is at the upper end in quality. Second, overhead doors are the best type of setup for daily residential use for moving cars in and out of the structure. They also come in various heights and widths up to 8' x 18'. The image at the left illustrates how typical overhead doors function and shows a power operator attached. These type of doors are very serviceable, easy to maintain, and come in diverse styles to match any architectural theme needed. They are available in wood or steel and can be insulated by the manufacturer, or after installation by you. 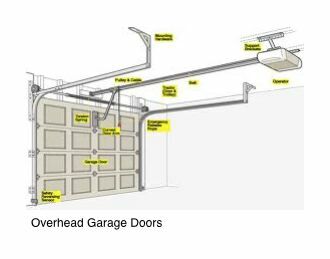 Garage Tips: If your considering upgrading your overhead doors look at the cost as an investment that nearly pays for itself. According to the most recent cost vs. value reports from Remodeling Magazine, upgrading from a basic to a mid-tier garage door has a higher expected return at resale than remodeling your master bath or kitchen. Listen to what the CNN Help Desk has to say about renovation costs in this short video. Share your GarageTips with our readers about garage doors and any problems you have tackled in the way of maintenance, etc. If you have photos or graphics that would help explain your story, feel free to upload them.